I now understand (after reading feature request #248403) that the layer timestamp is color-coded to indicate the relationship between OBS_TIME and data availability. It was not intuitively obvious to me what the color-coding meant while using the software. When I Added a layer and the first one had a green timestamp and the second one a red, I thought it is a color differentiation between the two layers, not that it had an underlying meaning about time proximity between the two layers. This problem could be mitigated by a tool-tip (there is not one now) but I am not sure that it is a strong enough cue given the severity of what this notification implies. 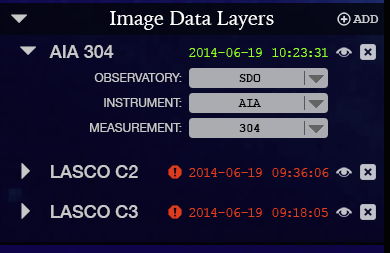 Notifying the user that layer #1 has an EIT from Nov 21, 2009 while the closest layer #2 of LASCO is from May 12, 2006 should perhaps be more "intrusive" and not as subtle as a color change. "Warning! Large time interval between requested time and AIA 304 observation time." would show up and then disappear. This might form part of an improved and more general purpose user notification system. Are you sure you'd like multiple growl notifications to potentially appear each time the user clicks Time Step buttons to skip forward and backward in time? I think alternative solutions still need to be considered. Consider adding a Warning or Error icon next to the timestamp, with a tooltip explaining the problem. to red. What is the formula for this? There might be some way to use that. > tooltip explaining the problem. > ** Attachment added: "Screen Shot 2014-06-26 at 9.45.01 AM.png"